In autumn 1939 just 19 years had passed since WWI, named the Great War, had ended. 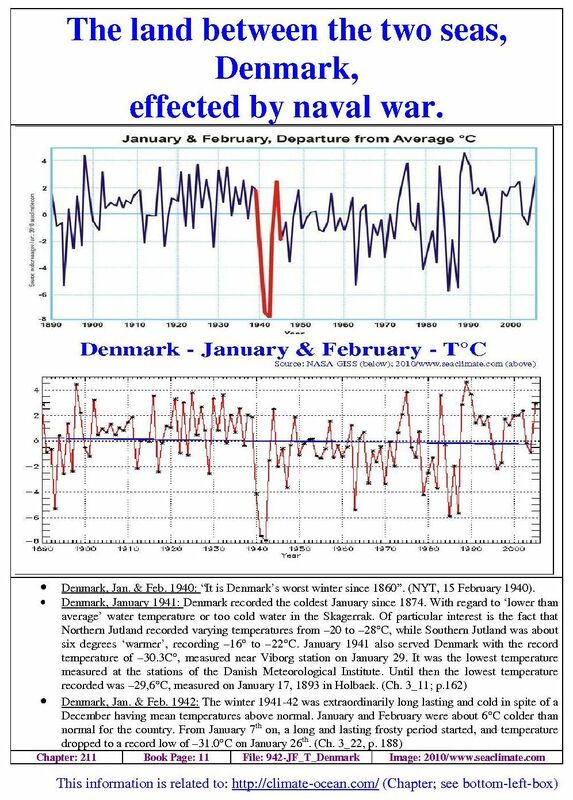 With the end of WWI a dramatic temperature rise had started in the Northern North Atlantic, generating the expression “Greening of Greenland” and “Warming of Europe”. The ‘Big Warming’ was most pronounced at the Norwegian Island Spitsbergen (Svalbard) high in the North bordering the Arctic Sea. The pre World War II winters were the warmest for several hundred years. Suddenly, without any geophysical event, e.g. volcano, earthquake, or meteorite the Northern hemisphere in general, but particularly Northern Europe plunged to Ice Age conditions. 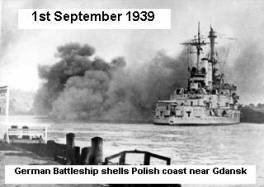 Not nature had caused weather to change the course but huge naval armadas going into action on September 1st 1939. British Cold Snap Can Now Be Told. Military Censorship on the Weather Lifted – Freeze Severest Since 1894. Press Has Noted Subzero Spell in Europe Without a word of Arctic Conditions locally. Now it can be told. For the first time since the war began, British censors today allowed that humdrum conversational topic, the weather, which has been a strict military secret in Britain, to be mentioned in news dispatches – providing the weather news is more than fifteen days old. The weather has been so unusually Arctic that by reaction the censors’ hearts were thawed enough to permit disclosure of the fact that this region shivered since past several weeks in the coldest spell since 1894, with the mercury dropping almost to zero and a damp knife-edged wind piercing the marrow. While British newspaper readers’ teeth chattered, the newspapers told them about a cold wave sweeping Europe, with sub-zero temperature records in Germany, Finland and neutral countries.” (NYT, 28 January 1940). Note: Temperatures reported by NYT are in Fahrenheit. (A) Lost West Drift, 2_12. (B) Sea war events, 2_13, Sea mines, 2_14, Depth charges, 2_15. (C) North Sea cooling , 2_16; Baltic Sea cooling, 2_17. This section proposes to concentrate entirely on the ultimate outcome of the weather conditions in Northern Europe during the first war winter of 1939/40. It will be done mainly by providing a list of significant events from mid December 1939 until the end of February 1940. These events will demonstrate in the most convincing manner how extraordinary and how severe this winter was. It shall particularly raise the awareness that the arctic winter 1939/40 must have been caused by something. Much of this information has been mainly compiled from reports from three newspapers: The New York Times (NYT), the Neue Zürcher Zeitung (NZZ) and the Hamburger Anzeiger. The marvellous job The New York Times did is highly appreciated. Their reporting was outstanding, excellent, comprehensive, detailed and prompt. Further details: (A) concerning impact of El Niño, see : Lost West Drift, 2_12. Before starting with the historical list of events, a brief climatic assessment on the severity of the winter conditions in Northern Europe is compiled. It was the coldest winter for more than 100 years for some countries or parts thereof, e.g. Sweden, Germany and Holland. The centre of the “cold pole” in winter the 1939/40 could be located within the triangle Rotterdam – Hamburg – Koenigsberg/Kaliningrad - Riga – Budapest. However, for all countries in the Northern European realm relevant information is compiled in the Chronicle (below, last section), just to give a basic idea as to the exceptional nature of this winter. Further details: (A) Sea war events, 2_13, Sea mines, 2_14, Depth charges, 2_15. (B) Oceans at war, 4_11, Ocean system affected, 4_12. January 1940 had the lowest mean temperature over Britain. The mean temperature at sea level was 33’0°F over Scotland, and 31’7°F over England and Wales,. January 1940 was probably the coldest for 100 years. in Durham: January mean temperature (34.8°F) was the lowest of a table 1901-1940; the February temperatures correspondingly were the lowest since 1902. The winter of 1939/40 ranks as No 8 in the list of the coldest winters since 1706, and was the coldest since 1845. The meteorologists say that last month has been colder than any January in the last one hundred years, with mean daytime temperatures of 23 degrees Fahrenheit (-5°C). (NYT, 1 February 1940). “February has not yet reached January’s disagreeable record but during the last two days has not been far away”. (NYT, 15 February 1940). The coldest winter since 1830.” (NYT, 20 February 1940). The mercury dropped to 54 degrees below zero Fahrenheit at Tynset, in Eastern Norway. (NYT, 18 January 1940). On the basis data for four months i.e., December – March, the winter of 1939/40 ranked 9th in the list of the coldest winters since 1757, trailing behind only the winters of 1880/81 (rank 6); 1837/38 (rank 5); 1808/09 (rank 2). On the basis data for three months the winter is ranked No.10., succeeding the winter of 1892/93 (rank 9). “In Sweden all cold records were broken in the last twenty-four hours, the coldest since 1805.” (NYT, 21 February 1940). Kobenhavn –378.5 (204.0); Fanø – 349.9 (208.2); Hammershus - 305.6 (176.4); Bogø – 438.0 (235.0). The lowest winter temperatures noted had been for December(-22.2°C); January(-24.3°C); February (-27.4°C); March (-22,0 °C). “It is Denmark’s worst winter since 1860”. (NYT, 15 February 1940). The Chronicle (below) provides further information on the severity of the situation in Denmark. The lowest temperature in seventy years was reported at Riga, Latvia, with a reading of 47.2°F degrees below zero (-44°C); (NYT, 18 January 1940). 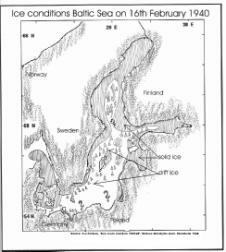 Remark: Information on the weather situation during the WWII war winters in the Baltic countries is rare, if existed at all. Presumably, Tallin, Riga and Vilnius experienced the same glacial war winters as Stockholm, Copenhagen, Rotterdam, and London from 1939 to 1942. For Berlin and Halle it was the coldest winter in 110 years. The assessment is based on the ‘summary of the daily mean data from November to March’. For Berlin (correspondingly for Halle), the data noted for 1829/30 is the ‘cold sum’ figure -791°C, for the winter 1939/40 the figure is -736°C. These data are confirmed by other researches as well. The coldest January months with respect to Berlin since recording started in 1719 are: 1823, 1838 and 1940. 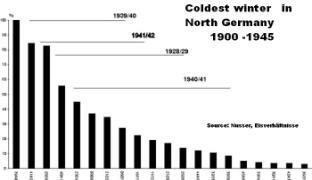 With regard to the winter of 1928/29, February (-10.4°C) was colder than February 1940 (-7°C), but as January 1929 is not among the 20 coldest winter months, the winter 1939/40 ranks higher on the list of cold winters16For Dresden the winter of 1939/40 (December-February) was the second coldest in the 115 year record, only surpassed by the winter of 1829/3017. Dresden recorded the coldest January ever measured since observations started, with minus 9.1°C from average, while the previously lowest figure for 1838 was minus 8.2°C. It was the coldest January for at least 112 years18. For Darmstadt (near Frankfurt a. M.) the winter was the severest since 1837/38 and 1829/30 accompanied with abundant snowfall19. The winter 1939/40 ranked 6th among the 115 year record, and occupied third place in the list of frost days, after 1829/30 (84), 1890/91 (82), and 1939/40 (76); while the coldest February in the last 115 years occurred during the winters of 1929/30 and 1939/4020. Italy experienced some cold from the end of December 1939 to mid January 1940. A record low had been measured in Modena with 13.8°F (-25 °C) on 15th February 1940. (NYT, 16 February 1940). For further details concerning the weather conditions in the Mediterranean from end of December 1939 to mid January 1940 (see: Turkey quake, 2_51). An assessment concerning the earthquake in Turkey on 27th December 1939 is given in: Turkey quake (A). Further details: (A) Turkey quake, 2_51. The months October to December 1939 had been very dry all over the US, (A) which may have some connection to the military activities in Europe and Asia in autumn 1939. (B) January 1940 was cold, followed by a mild February23 Due to above normal average temperatures over the arctic (and Siberia), the cold pole over Canada has moved south towards the US in January 1940. 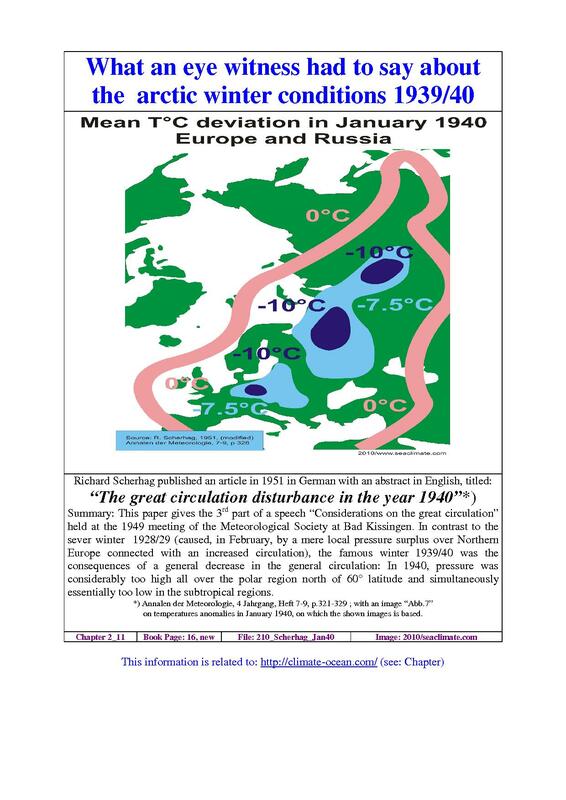 According to Scherhag24 January 1940 saw the ‘typical picture of a weakened sectional circulation’. Brooks observed that most of eastern Canada north of latitude 48°N was above normal in January 1940, with deviations running up to more than 25°F above normal north of latitude 58° N and 18°F above normal in the interior of Alaska. Missouri was actually as cold as the Hudson Bay region for the month25. NOTE: The temperatures reported by The New York Times are always in Fahrenheit; some of which have been converted to Celsius (in brackets). 22/23 December 1939; Snowstorm at the Petsamo (Arctic) Front in Finland with minus 30°C to minus 36°C (Frankfurter Zeitung, 23 Dec.39). 22 December 1939; A very severe snowstorm brought shipping in the Black Sea and the lower Danube river to a standstill on Thursday (21 December 1939). At the coast the temperatures dropped to 15°C below zero. The stormcaused considerable damage in Bucharest. (Hamburger Anzeiger, 23/24 December 1939). Snow also fell all over Bulgaria on 21-22 December, starting a new cold weather episode (down to -16°C), 24th in Northern Bulgaria -20°C, (according to Bulgarian newspaper ‘Zora’; by personal communication). 23 December 1939; Heavy snowstorm reported from Latvia (Hamburger Anzeiger). 29 December 1939; Ice closes Danube to German supplies; Rail traffic expected to be hampered by snow (NYT, 30 December 1939); “Cold winds recently have been blowing westward from Russia and the constantly low temperature in the river valley indicates a general freeze will set in soon.” (NYT, ditto). 29 December 1939; From Agram in Yugoslavia temperature of minus 32°C is reported. (Neue Zürcher Zeitung, 31 December 1939). 30 December 1939; Cold wave over the Riviera. In Genoa a rapid fall of temperature was followed by an extensive snowstorm. Trieste reports heavy winter storms. Milan had minus ten degrees Celsius during the Saturday night. (Neue Zuercher Zeitung, 31 Dec. 1939). 30 December 1939; “An unprecedented and severe snow storm in Naples region today indirectly caused a train wreck in…”. “Rome’s heaviest snowfall in recorded history - six inches - made the Romans feel as New Yorkers did in the 1888 blizzard. There had been nothing close to this as snow fell for three days continuously from December 16 to 18, 1846. (NYT, 31 December 1939), (so also: Neue Zürcher Zeitung (2 Jan. 1940), but snow fall lasted only for eight hours. The snow melted away in a few hours on 1st January 1940). Yugoslavia with minus 23°C (Frankfurter Zeitung). 1 January 1940; All navigation on Danube stopped owing to ice28. 2 January 1940; Weather curtails West Front Action. (G.H. Archambault reporting) With the cold becoming keener and much snow under foot, activity on the Western Front is best described as relatively – very real to the men who must continue to patrol, but virtually insignificant from a military point of view. Rain and mud are bad enough; snow and ice are even worse. (NYT, 3 January 1940). 8 January 1940; A record frost today covered Northern and Central Russia, with the thermometer at 31 degrees below zero Fahrenheit (-35°C) and affected normal activity. (NYT, 9 January 1940). Sport events have been cancelled. Twelve persons with frozen legs – the majority intoxicated – were picked up by ambulances. (NYT, 11 January 1940). 10 January 1940; Cold weather, worst in Hungary since 1929, is expected to break all previous records. Already the Danube is a solid sheet of ice. (NYT, 11 January 1940). 11 January 1940; Sea freezing near Odessa. Very low temperatures over the Black Sea. Rumania caught in minus 33 °C cold,(according to Bulgarian newspaper ‘Zora’; by personal communication). 11 January 1940, Berlin: Mercury dropped to about four degrees below zero, Fahrenheit (-20°C), in the capital and to about five below zero in the suburbs. (NYT, 12 January 1940). 11 January 1940; Riga –41° C; Budapest -26° C (Neue Zürcher Zeitung, 11 January 1940). 12 January 1940; Amsterdam. Floating ice is halting traffic on the rivers Rhine, Maas and Yssel. The ports of Amsterdam and Rotterdam are being kept open with considerable difficulty. The cold increases losses already caused by war conditions. For instance, the number of ships calling at Rotterdam has dropped from 1,300 per month before the war to 380 now. (NYT, 13 January 1940). 12 January 1940; From the lowland of Rumania a severe cold of minus 35° C flows to Besarabia. The ice in the Danube becomes more firm and has already reached a thickness of 35 cm at some places. (Neue Zürcher Zeitung, 13 January 1939). 13 January 1940; The temperatures fell to 25.6 degrees below zero Fahrenheit (-31.5°C) in Northern Rumania, and many villages in Dobruja were snowbound. (NYT, 14 January 1940). 13 January 1940; Riga/Latvia; The bitterest cold wave for years, which sent temperatures in the Baltic countries down to as low as 40 degrees below zero Fahrenheit, ended here abruptly today. The mercury rose rapidly to a few degrees below zero. Parts of the Baltic Sea have frozen over and floating and pack ice are likely to interfere with shipping for some time. (NYT, 14 January 1940). 13 January 1940; In the Soviet Union, extreme cold, particularly at the Don, temperatures on Friday,12 January was minus 38° C. (Neue Zürcher Zeitung, 14 January 1940). 14 January 1940; Amsterdam. A break in freezing weather supplemented by rain, fog and melting ice (came). (NYT, 15 January 1940). At least two ships were crushed in ice packs on the Rhine and Ijsselmeer Rivers and thirty others were damaged severely. (NYT, 14 January 1940). 15 January 1940; Temperatures of 40 degrees below zero Fahrenheit reported from Warsaw, and the Danube frozen solid, there is no doubt that Eastern Europe is in the grip of an icy winter which is made doubly hard by the war. (NYT, 15 January 1940). 16 January 1940; Headlines: Snowstorm eases anxiety in West. German Attack; Dependant on Machine; Held Unlikely in Present Weather. No Visibility for Planes. Snow has been falling steadily all day long after a night of heavy thaw. (NYT, 17 January 1940). 17 January 1940; Cold paralyses Northern Europe. The unexpected swiftness with which temperatures fell was featured in almost all weather reports. After comparatively warm weather over the weekend, the temperatures suddenly began dropping towards the bottom of the thermometers. A typical report from Riga said that the temperature was at freezing point on Monday morning (15 January) and at 22 degrees below zero Fahrenheit yesterday morning. Then it tumbled to 47.2 degrees below zero – a drop of 79.2 degrees in about thirty-six hours. (NYT, 18 January 1940). 17 January 1940; Moscow. Severe cold continued in Moscow today, the average morning temperature being 49 degrees below zero Fahrenheit (-45°C). (NYT, 18 January 1940). 17 January 1940; Helsinki. “Pitiless, deathly cold laid a glacial hand on Russian’s war machinery tonight… near Salla, above the Arctic Circle. Phenomenal 54-degrees-below-zero Fahrenheit temperature (-48°C) restrained the Russian air forces, …and apparently immobilised Russian ground forces, which have been attacking on the Karelian Isthmus. (NYT,18 January 1940, front page). At Viborg the thermometer registered 54.4 degrees below zero Fahrenheit, while at Helsinki the temperature sank to 23.8 below zero Fahrenheit. (NYT, 18 January 1940, inside page). Remark: As both cities are less than 200 km apart the difference should be seen with suspicion. Tallin, just opposite the Gulf of Finland reported 14.8 degrees below zero. On the other hand Riga reported 47.2 degrees. (ditto). In Berlin the temperature tumbled 40 degrees, but the exact reading could not be transmitted abroad ‘because of military reason’. (ditto). 17 January 1940; Budapest. The Danube is entirely frozen over. About 1,200 tugs and barges fully loaded have taken refuge in Hungarian ports. About 85 per cent of the transport is destined for Germany. Of these, 200 are oil tankers and 400 carry grain. (NYT, 18 January 1940). 21 January 1940; “The cold polar air remained stagnant over vast areas of Europe and North America. Result: One of the coldest weather in half a century. In Mos-cow the tempe-rature dropped on Wednesday (January 17) to 49 degrees below zero Fahrenheit (-45°C), in parts of Finland to 58 below zero. Such temperatures can be measured only on alcohol thermometers, as mercury freezes solid at 38 below. (NYT, 21 January 1940; Weekend in Review, ‘War in the Cold’). 21 January 1940: -23C was recorded at Rhayader (Wales). 26 January 1940; Headline: Cold Greater Foe Than Germans For French Army in Front Lines. Most Severe Winter in Generations Taxes Troops’ Endurance to the Limit but Test Is Met With Courage (NYT, 27 January 1940). It has been freezing for six weeks. Everything is frozen – the bread in the sling bag, the wine in the canteen. (ditto). 28 January 1940; In the close vicinity of London the river Thames has frozen for the first time since 1814. (Neue Zürcher Zeitung, 29 January 1940). 29 January 1940; Icy Storm Hits Britain; London Has Heavy Snow (NYT, 29 January 1940). Heavy snow paralyses Britain; Transportation is badly affected. Trains from Scotland fail to reach London. The united Press said that snow was falling over most of the country yesterday and that the cold broke a forty-six-year record. Snow still was falling heavily over most of the country today and there were three inches of snow in the centre of London. (NYT, 30 January 1940). 31 January 1940; Crawford/Scotland had been cut off by a blizzard raging over the British Isles last Saturday (27 January). Newspapers permitted to publish the first details of the blizzard, called it the coldest weather in a century. (NYT, 01 February 1940). 1 February 1940; Activities increase on Western Front. French send out four patrols as cold moderates. With the cold becoming less bitter on the Rhine-Moselle front, more activity is developing. …Once again casemates along the Rhine have exchanged shots. After months of complete calm such exchanges are becoming more frequent. (NYT, 2 February 1940). 11 February 1940; Sweden. Stockholm set a lowest record with 13 degrees below zero Fahrenheit (-25°C). (NYT, 12 February 1940). 13 February 1940; Europe suffered tonight …in the cold wave, which extended from the Arctic fringes of Norway and Finland…the Baltic countries, to the Netherlands and Hungary. (NYT, 14 February 1940). 13 February 1940; Amsterdam. Europe suffered tonight in the paralysing grip of the bitterest cold in more than 100 years. Hundreds of persons abandoned their homes in the face of crushing ice packs boiling up from ice-locked canals, rivers and seas. Weather Bureaus here recorded the lowest temperature ever recorded in this country, 11.2 degrees below zero Fahrenheit (-24°C). To the Netherlands, which has a rather mild climate, this is more severe than the lowest temperatures recorded in Minnesota. The average for the whole country was 1.4 degrees above zero (-17°C). Water transportation in the Netherlands has been completely paralysed. The canals have been covered with thick ice for more than six weeks, while the traffic on the Rhine and Waal stopped on January 11. (NYT, 14 February 1940). 13 February 1940; Baltic countries. In Estonia, Latvia and Lithuania more than 10,000 persons suffered severe frostbite. At least five persons froze to death in the three Baltic countries, where temperatures reached 54 degrees below zero Fahrenheit (-47,7°C) recently for the first time in 160 years (NYT, 14 Feb. 1940). Baltic Sea frozen over. (ditto). 13 February 1940; Hungary. The most severe snowstorm in memory has been raging over Hungary all evening. The whole country is covered with snow several feet deep. (NYT, 14 February 1940). 13 February 1940; Romania. Romania reported heavy snowfall particularly in Bessarabia. (NYT, 14 February 1940). 15 February 1940; All records for cold in Europe were broken last month and just when it was hoped the worst was over, another cold wave has bound the whole continent. (NYT, 15 February 1940). 15 February 1940; Budapest suffered today from the bitterest cold for sixty years, 28 degrees below zero Fahrenheit (-33°C). (NYT, 16 February 1940). 15 February 1940; Ice-locked canals and rivers and snowbound trains made it impossible to transport coal. New blizzards, with snowfall heavier than any in Germany for decades, caused delays for hours in all transportation. Snow was three feet deep in the streets of Berlin’s suburbs. 15 February 1940; Italy is undergoing a new period of exceptionally severe cold with temperatures several degrees below freezing in some northern towns. The record low today was held by Modena with 13.8 degrees below zero Fahrenheit. 15 February 1940; In France canals that had been icy for weeks had scarcely been opened when the new cold wave bound the broken ice blocks again, immobilizing barges everywhere. (NYT, 15 February 1940). 17 February 1940; Slovakia. Cold cripples Slovakia. Following two days of snowfall and a period of bitter cold, Bratislava was largely cut off from the outside world. (NYT, 18 February 1940). 19 February 1940; Holland/Amsterdam. The coldest winter since 1830. (NYT, 20 February 1940). 22 February 1940; Berlin had a sudden thaw today after two months of cold and snow such as the city has not seen for decades. At Warsaw workers clear away nearly three feet deep snow. (NYT, 23 February 1940). 25 February 1940; Danube river is still ice-choked. (NYT, 26 February 1940). Further details: (A) North Sea cooling, 2_16, Baltic Sea cooling, 2_17.